As homeowners, we’ve all experienced the struggle of biting off far more than we can chew when it comes to our own electrical systems. Trying to figure out how to run wires through the wall on your own can be disastrous. You and your family may be enjoying a peaceful night at home before the power just shuts off. Don’t worry, Rack Electric is here to help. As the premier Coral Springs electrician company for over 20 years, Rack Electric has provided the best electrical services. Our experts have masterfully serviced homes across Coral Springs and South Florida, helping our families with whatever they required. It doesn’t matter how hard the job may be, you can count on Rack Electric to successfully complete a job better than anyone else. The right kind of lighting fixtures is essential for completing any room. An electrician in Coral Springs would need to perform this job in order to provide professional work. The electrician would begin by checking the voltage with a voltage detector. This device tests the presence of electricity in a piece of equipment. Using a wire bolt cutter, the electrician can shorten screws without running the threads. Next, the individual will extend short wires with an extra wire connected stab-in which needs to be the correct size. A box extender will then be placed over the old box behind the wall surface. This is common when a layer of wood or drywall has been installed over the original ceiling. The electrician will then bend a scrap of wire to support the fixture as the device is being installed. A screw is then aligned with a thin screwdriver to hold the fixture’s canopy in place. Electrical wiring is an electrical installation of cabling and is associated with devices such as switches, distribution boards, and lighting fittings in a structure. In most modern homes a nonmetallic metal wiring is used to wire a home. The wires are wrapped inside a plastic sheathing. The proper wire size is essential to any electrical wire installation. The correct size of the wire will indicate the diameter of the metal which is based on the American Wire Gauge system. Wiring is used to run many appliances and fixtures in a household and allows systems to run efficiently. Extension cords, cooktops, light fixtures and lamp cords all use a certain type of wire Gauge and allow these devices to function properly. Our Coral Springs electricians can help you wire your home or business. 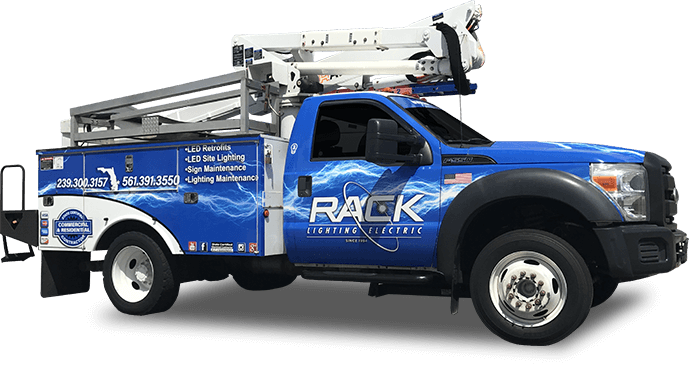 Rack Electric’s, the best electricians in Coral Springs, is family owned and operated and has certified professionals to complete the job. Call Now! (561)-391-3550 to schedule a home or a business electric repair or installation for a better and more efficient system.